Known as the "Quicker Picker Upper", these durable everyday Bounty towels offer superior strength and absorbency for whatever messes you have to deal with. Bounty 2-Ply Kitchen Towels contain the smallest spills and the biggest kitchen messes quickly and easily. Ideal for use in kitchens and break rooms as well as garages and workshops when you need a quick clean-up. These perforated towels comes with 40 sheets per roll measuring 11" x 10.2" each. Each carton includes 30 rolls so you'll always have extras. 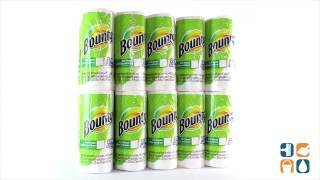 Order Bounty 2-Ply Kitchen Paper Towels today and save. Buy in bulk and save even more!